Catholic Charities Diaper Bank provides diaper distributions to families in need with children aged 3 and under. The Diaper Bank helps low-income families keep their young children clean, dry, and healthy by providing 6 diaper distributions each year. 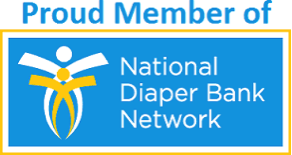 Diaper Bank members receive 30 to 60 diapers, depending on supply, and one package of wipes at each distribution. Catholic Charities Diaper Bank is an affiliate of the National Diaper Bank Network. Any family wishing to join the Diaper Bank must call the Bayard House, 302-654-1184, to schedule an intake appointment. Regular office hours are 8:30 am to 4:30 pm. Parent[s]/guardian[s] must be a Delaware resident, and their child must be 3 years of age or younger. Parent[s]/guardian[s] must meet established financial guidelines. Qualification for WIC, for example, will qualify for Diaper Bank membership. Click here to send an email for information about our Diaper Bank. Click here to download registration materials for the Diaper Bank. The Diaper Bank operates with generous donations from the community. Make a diaper donation. All diaper sizes are needed. 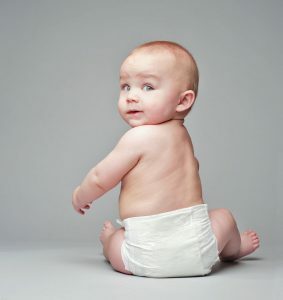 Often overlooked are larger sized diapers, sized 4, 5, and 6. These are always in short supply. Also needed are wipes and other baby hygiene items. Donations can be brought to the Bayard House. Please call ahead if you are making a large donation. Organize a diaper drive. Ask your family, neighbors, church, or civic group to donate diapers and hygiene items. Click here to get a Diaper Drive toolkit. Donations can be brought to the Bayard House. Please call ahead if you are making a large donation. Click here to donate to our Diaper Bank using a credit card. You may also send a check to Catholic Charities, 2601 W 4th Street, Wilmington, DE 19805, and designate Diaper Bank on the check.